The perfect blend of experience and customer care. David grew up in Vermont, playing in the forests and fields around his family's farm. At the age of 17, he decided to build a cabin by himself without power tools. He finished it after high school and lived there for two years, spending time learning to track animals, identify trees and plants and birds, as well as navigate. He worked for four years at a primitive summer camp for 11-15 year old boys called Farm and Wilderness. When camp ended the fourth summer, he built a birch bark canoe and paddled some 400 miles until freeze up. He has apprenticed with a wildlife tracking instructor, and a hide tanner- leather worker. He completed an internship in primitive living at the Teaching Drum Outdoor School in Northern Wisconsin. During his time there David lived on a remote lake in primitive dwellings, eating a largely wild food diet that was gathered or fished using primitive methods. David’s next big adventure took him on a canoe trip to northwestern Ontario. With a friend, he paddled hundreds of miles through the bush, eating exclusively wild food for about 6 months, and doing without bug repellent and rain gear. While traveling in Canada, he fell in love with the Northcountry and its vast wilderness, intact ecosystems, and powerful landscapes. He worked as a carpenter to scrounge up some money, and drove to Eagle, Alaska. He lived in the village of Eagle for the next four years, spending his winters establishing a trap line with a small dog team 65 miles downstream and working as a Fisheries Technician for Fish and Game 1600 miles downriver, near the mouth of the Yukon in the summer. 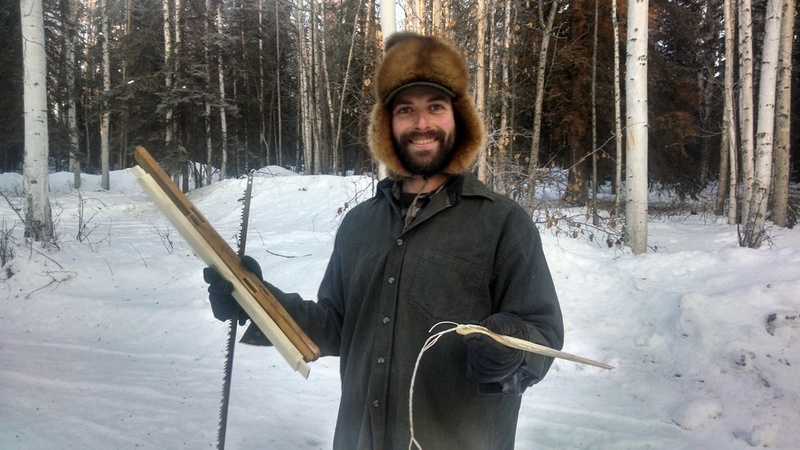 He currently teaches classes for the Folk School in Fairbanks and guides for Arctic Wild LLC in the summer. David holds a Wilderness First Responder certification. Jenna grew up outside of Detroit, Michigan in a family that built kayaks in their living room. She began skiing, rock climbing, camping, and whatever else her parents could drag her along to at age three. She participated in a number of youth outdoor adventure trips and studied at Kalamazoo College in Michigan and the Institute for Sustainable Development International in Chaing Mai, Thailand. Jenna came to Alaska to research for her thesis project on Alaskan history and complete an internship for a non-profit environmental organization. Almost instantly, she fell in love with the wide skies, distant mountains, and spongy tundra of the interior. She returned a week after graduating with her Bachelors and has been hard at work exploring the arctic and interior by boat, ski, dogsled, bike, and foot. She loves cooking, dabbles in herbalism, and strives to sleep outside more than inside. In the summer she works as a fisheries technician, teaches at the Folk School in Fairbanks, and guides backpacking and canoe trips for Arctic Wild. She holds a Wilderness First Responder certification. David and Jenna lived across a creek from each other in Fairbanks’s Goldstream Valley for two years, but they lived there in opposite seasons so they never met. For two summers, every day Jenna would walk by David’s cabin and cross a log bridge to her “treehouse” dwelling. For two autumns, David would return to his cabin in the fall just after Jenna lugged the last of her belongings across the bridge to rent a cabin with enclosed walls for the winter. One day, their meddlesome landlord got the spunky idea to set them up. They paddled the creek together after breakup but had to part ways as David headed 800 miles downriver to work a season as a fisheries technician near the Mouth of the Yukon, while Jenna headed 200 miles north on a month-long canoe trip on the Colville. David got home in September, cut down the tree pictured below, made Jenna a paddle, and together they hitchhiked 370 miles to Eagle, Alaska, canoed 160 miles to Circle, Alaska, and hitched back home. They have been partners ever since. Through the years, they have struggled to find a way to balance living the subsistence lifestyle they love, supporting themselves financially, and a desire to share their passion with others. Spending long hours on the trail they began to envision a merging of their passions- outdoor fun, subsistence lifestyle, and sharing with others. There were lots of tourist opportunities in Alaska, but most seemed like shallow impersonations, scratching the surface of what this vast and diverse state is really about. Boreal Journeys is an attempt to take visitors to a deeper, more authentic experience of Alaska, one that is not centered solely on sublime landscapes and plastic accouterments, but rather the real products, people, and lifeways that make our lives in the north rich and meaningful. Boreal Journeys offers dogteam-supported guided snowshoe and ski trips trips in Alaska's interior. We offer an authentic Alaskan experience, using handmade gear, eating locally harvested food, and teaching clients bushcraft and survival skills.